Foster care saves lives by providing temporary care to underage, injured or ill animals, giving them the time they need to heal and grow strong enough for adoption. Being a Foster Parent can be a positive and rewarding experience, but it isn’t always easy. Fostering homeless animals requires compassion, responsibility, patience and knowledge in order to respond to each animal’s individual needs. HSMO will provide the animal’s food, supplies, and medical care, while you provide a safe environment and lots of love for 2-8 weeks. How long will the fostering period last? It depends on the species, age, and condition of the animal(s) you are fostering. Two to eight weeks is not unusual for healthy underage kittens or puppies, but an animal recovering from surgery or undergoing treatment for heartworm may require a longer period of time. Can my foster animals play with my pets? It depends. Nursing, newly weaned animals, and animals being treated for a contagious illness should be kept separate from your pet. Older animals and animals being fostered for socialization may benefit from interactions and playtime. Our Veterinarian and Foster Care Coordinator will advise you on how to best provide for your foster pet. How old do you need to be to become a Foster Care Volunteer? The primary, daily caregiver must be at least 18 years of age. Providing foster care is a great way for children to get involved with helping homeless animals, but their interactions must be supervised by an adult at all times. Due to their frail condition, very young animals should not be handled by children under 4 years of age. Can my foster animal(s) go outside? Cats and kittens must be kept indoors-only during the entire fostering period. Unweaned puppies must also be kept indoors. Weaned, active pups that have started their vaccines and adult dogs may be allowed outdoors in your secure, fenced yard under your direct supervision. Puppies under 6-months of age and dogs being treated for contagious illnesses should never be taken to public areas or dog parks. What if the animals require veterinary treatment? 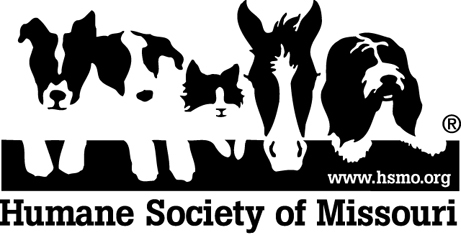 There’s a good chance that most of the animals you foster will require some type of medication or vaccines but don’t worry, HSMO provides all veterinary care, treatments, and vaccinations at no cost to you. What if something comes up and I need to leave town? While we hope you can be available for the entire fostering period, we understand that things come up. If this happens, please contact the Foster Care Coordinator or your Foster Representative to schedule returning the animals to HSMO and we’ll look for another volunteer who can take over. 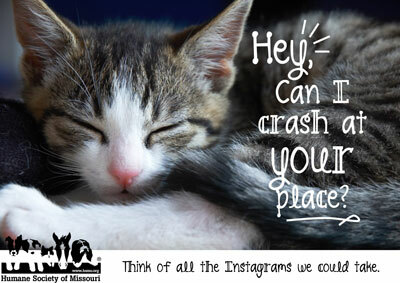 Please note: If you are going out of town, you cannot hire someone to take care of your foster animals and animals cannot be transferred to another caregiver’s home unless that person is a registered HSMO Foster Care Volunteer and the transfer has been re-approved by the Foster Care Coordinator.